Visit Tower Bridge Exhibition and enjoy stunning views of London from the high level walkways above the Thames. Learn all about the Bridge's construction and history, then continue your exhibition journey to the Victorian Steam Engine Rooms. Step inside the Most Famous Bridge in the World! The lifting of Tower Bridge has become a must see event for visitors to London. Come and see the bridge raise, then tour the engine rooms to learn how it works. All this and more when you visit the Most Famous Bridge in the World! 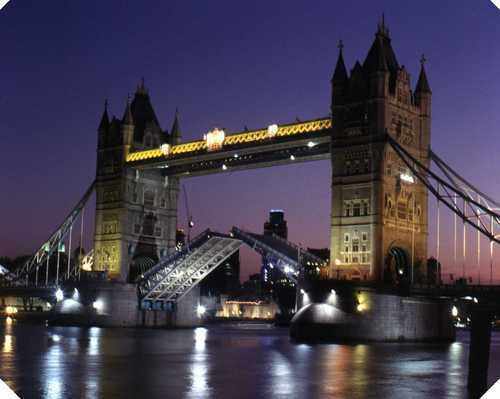 Tower Bridge is a combined bascule and suspension bridge in London, England, over the River Thames. It is close to the Tower of London, which gives it its name.. It has become an iconic symbol of London. The bridge consists of two towers which are tied together at the upper level by means of two horizontal walkways which are designed to withstand the horizontal forces exerted by the suspended sections of the bridge on the landward sides of the towers. The vertical component of the forces in the suspended sections and the vertical reactions of the two walkways are carried by the two robust towers. The bascule pivots and operating machinery are housed in the base of each tower. Its present colour dates from 1977 when it was painted red, white and blue for the Queen's Silver Jubilee. Originally it was painted a chocolate brown colour. The high level Walkways are open to the public, with exit to the Victorian Engine Rooms provided via the South Tower lift. Please note that the Walkways are accessible only via the stairways in the North Tower of the Bridge while the lift remains closed and we do not offer any facilities for baggage or pushchair storage. Bridge lifts are available at no charge, 24 hours a day, 365 days a year.